! ATTENTION ! TO AVOID EXTRA CHARGES PLEASE READ BELOW !!! Minnesota Hygienic queens for 2019 will be available for pick up or to ship the end of APRIL up to the end of JUNE. Our MN Hygienic Queens are a product of the University of Minnesota and Dr. Marla Spivak working in cooperation with commercial beekeepers. They produce and winter as well as any breed, and have a higher resisitant to most known bee diseases. We still recommended you treat your bees. Postage/Handling - $12.50 for Priority-Mail on 1-10 queens,/, OR,, $26.00 for Express Mail UP TO 10 queens per envelope , 11-20 queens shipping is $25.00 Priority Mail. Insurance is extra. Insurance $1.85 to 5.95 depending on how many you get. ***Postage is extra, and is calculated into the final cost. All queens will be shipped standard 1st class mail to zones 2 and 3. Zones 4, 5, and 6 will be shipped priority mail. ****Insurance is extra and is pro-rated by dollar amount of total queens ordered, and is calculated into the final cost. *****Queens can be marked for an additional fee (see AG633 Queen Marking). Queens will be marked with the color for this year. If you are placing an order for queens and need equipment, please place your order for live bees separatley from any equipment orders. Your shipping charges will calculate more accuratley for both orders individually. If you do place your order together the shipping will not be correct, extra charges will be applied, and your order will be held for payment in full . WE WILL NOT SHIP LIVE HONEYBEES ALONG WITH AN EQUIPMENT ORDER. QUEENS SHIP PRI-MAIL, OR EXPRESS MAIL ONLY. PRODUCT CAN NOT BE SENT IN THE SAME PACKAGE. A small colored dot is placed on the back of the thorax of the queen making her easier to spot in the colony and identifies what year she was installed (by the color) and if the original queen is still there. This will not harm your queen. 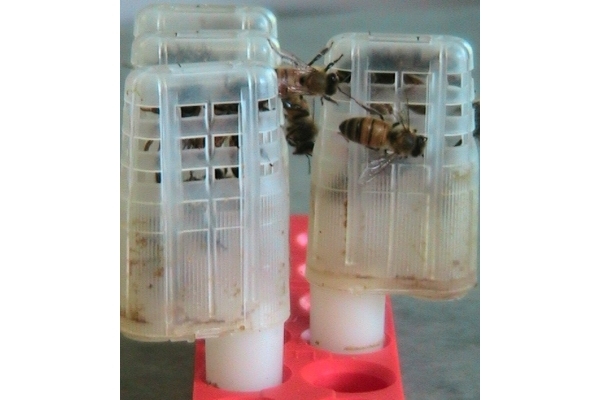 1) Be certain the colony is queenless and that any developing queen cells have been destroyed. 2) Allow the queen to be caged within the colony for 1-2 two days if you have just removed the old queen. 3) Depending on the queen cage received. tube freely in case an attendant parishes in the cage, they won’t block the exit. showing, place near the vicinity of young bees and brood. 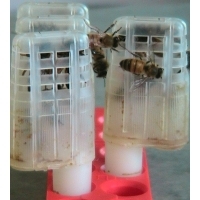 possible to prevent burr comb from being produced in the space around the queen's cage. her own, give it a couple of days. Introducing a new queen into your hive is never a sure thing. We are not responsable should she not be accepted into the hive. Please call if you have questions on how to install the queen into a queenless hive or split. We have very good luck shipping queens through Pri-Mial zones 3 - 6 & 1st Class Mail zone 2 only. Should a problem arise in shippment and your queen(s) do not make it, you will file a insurance claim at the post office or online, insurance is in your name, the post office will issue you a refund check if the claim is paid. We can ship a replacement queen (s), you will be charged for the new queens plus the shipping & insurance. We are happy to help should you have any problems filing a insurance claim at your post office. We are not able to ship queens out on days that it is raining or the temp is above 90, please be aware of this as we will not be calling you to let you know our weather. Shipping dates are not guaranteed, we will try to ship on the day you requested or as close to that day as possible. Please remember to open the package at the post office to check and see if they are okay, if not you MUST show your post master and get the claim form to fill out or go online www.usps.com , insurance is in YOUR name.